Citation: Lux. "The Entheogen Review: A Retrospective". Erowid Extracts. Nov 2008;15:20-21. 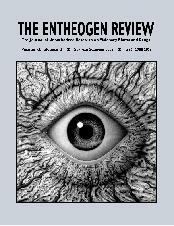 After sixteen years at the leading edge of unauthorized research into visionary plants and drugs, the final issue of The Entheogen Review was published at the end of 2008. Its editor, David Aardvark, granted an interview for this article. As only a few pamphlets and small-press books touching on psychoactive substances were in circulation at the time, DeKorne believed that a well-researched source of information would be a valuable addition. In the inaugural issue DeKorne noted, "The season is long overdue to shed a little light on this topic and separate a few facts from what appears to be a limitless mythology. "1 Inspiration for early issues of the publication came from sources such as the 1960s journal The Psychedelic Review and Thomas Lyttle's Psychedelic Monographs and Essays. Later influences included PIHKAL, TIHKAL, and Pharmacotheon. During DeKorne's six-year tenure as editor-in-chief, TER established a solid base of readers, some eager to share their own findings. Intrepid explorers described experiences with substances that were poorly documented at the time, including 2C-B, Salvia divinorum, and assorted ayahuasca analogs. One such enthusiastic subscriber was David Aardvark. "Before taking over as editor, I had regularly corresponded with Jim DeKorne, and he had printed a few of my letters in The Entheogen Review", Aardvark recalls. "That history between us gave Jim enough confidence in me to pass the torch." Aardvark took over in 1998 when DeKorne decided to step down, and the publication quickly doubled in size. Aardvark shared DeKorne's commitment to facilitating dialog in the psychedelic community. This helped make TER a platform for people to describe their own backyard research and bioassays. "Like Jim, I was interested both in learning and in helping other people learn." The commitment to careful editing of submissions distinguished TER from many other information sources. Aardvark critiques the penchant of authors like Adam Gottlieb, who penned several slim publications on the topic of legal highs, for passing along too much speculation. In discussing how smoking banana peels might get you high (it doesn't), Gottlieb wrote: "[s]ome experts believe that combustion converts some of the banana's chemistry into bufotenine..."3 Let the smoker beware! DeKorne and Aardvark communicated with many experts to help answer some of the questions that came up. "I enlisted Keeper Trout as technical editor when I took over the publication", Aardvark recalls. "Over the years we've received advice from Richard Boire, Jim DeKorne, Earth and Fire Erowid, Jon Hanna, Albert Hofmann, Terence McKenna, Jonathan Ott, Dale Pendell, Giorgio Samorini, Nick Sand, Sasha Shulgin, Rick Strassman, D. M. Turner, and Leander Valdes, just to mention a few of the more well-known names in the field." Art inspired by entheogenic voyages may evidence shared mental states, providing maps for inner space. Some mind states induced by entheogens may be protolinguistic; as such they would be ineffable through written or spoken language, yet visual art may allow their expression. Most traditional entheogen-using cultures produce art depicting the territory accessed via psychotropic plants [...][and] this has also been true in our own culture [...]. The diversity of content–first-person trip reports, scientific discoveries, art, music, and reviews of psychedelic conferences and cultural events such as Burning Man–all helped make TER a source of cross-pollination, relentlessly fascinating to the generalist. "People who never intend to manufacture LSD might still enjoy skimming a piece that relates a novel synthesis approach", Aardvark notes. "People who don't believe in parallel dimensions may nevertheless find reported visions of 'discarnate entities' to be engaging." In its 16-year span, The Entheogen Review witnessed and documented deep changes in the cultural and political climate of the United States. Aardvark speculates that interest in altered states of consciousness may have grown during the life of TER, and certainly, access to information has changed dramatically. "A 2002 AltaVista search for the word 'entheogen' resulted in 3,000 hits; today the same search provided 702,000 hits. In 2002 'psychedelic' returned 140,000 hits, and today it got 65,200,000 hits." Another metric of that change is the explosion of interest in Salvia divinorum, which transformed during his time as editor from an obscure entheobotanical to a multi-million dollar industry, and which is now increasingly banned across the United States. [S]o far no one particularly stands out in a 'leadership' position in the same way that Leary and McKenna filled that role. Perhaps this simply indicates that the field has reached a new level of maturity–one that supports many different voices and ideas, without requiring a solitary figurehead or spokesperson to rally the troops or inform the mainstream media. I'm optimistic about the future. (AUTUMN 1992) One of the earliest articles to mention the use of Phalaris grasses in ayahuasca analogs. (AUTUMN 1993) The first published account of the "quid" method of ingesting Salvia divinorum. (SPRING 1999) Early account on the oral activity of Mimosa tenuiflora ( = M. hostilis) sans MAOI. (WINTER 1999) Terence interviewed by J. Hanna and S. Thyssen, one of the last interviews he gave. "Moving Into the Sacred World of DMT"
(SPRING 2001) A now-classic discussion of DMT by Infinite Ayes. (WINTER 2001) Features a new technique for growing Psilocybes without using sterile procedures. (AUTUMN 2003) Includes a simple psilocybin extraction process via precipitation by Yachaj Paye. (WINTER 2003) Excellent article on growing mushrooms outdoors by Tyler D. Flyer. (AUTUMN 2006) Simple DMT kitchen extraction tek for Mimosa tenuiflora by Noman. DeKorne JB. "The Entheogen Review". The Entheogen Review. Sep 1992;1(1):1. Aardvark, D. "Welcome". The Entheogen Review. Fall 1998;7(1):1. Superweed MJ (aka A. Gottlieb). Herbal Highs: A Guide to Natural & Legal Narcotics, Psychedelics & Stimulants. Stone Kingdom Syndicate. 1970. Ott J. "Jonathan Ott Speaks... Part Two". The Entheogen Review. Summer 1999; 8(2):62–73. Summer Solstice 2003 Cover of TER. Featuring "Inner Eye", acrylic on canvas, by Naoto Hatori. 2000.
v1.0 - Nov 2008 - Published in Erowid Extracts. v1.1 - Jul 2009 - Published on Erowid.org.